There are many reasons to buy a standing desk (sometimes called stand up desks, sit-stand desks, or sit-to-stand desks), but there are so many choices that finding the best fit for your needs can be a challenge. This article summarizes things you should consider before you buy. First, is a Standing Desk Right for Me? Your goal should be to move often throughout the day, changing postures frequently, and a good adjustable desk is a tool that will help you do that. For many people, standing all the time is no better, and maybe even worse, than sitting all the time. In fact, it’s doing one or the other, all the time, that becomes a problem. If you choose an adjustable workstation, it will become a great tool on your path toward improved work comfort, performance, and your overall health and well-being. Should I get a Standing Desk, or a Sit-Stand Desk? Sit-stand desks and sit-stand desktop conversion units are designed to support both traditional sitting and standing work. Some desks are designed exclusively for standing or “perching.” Perching is a term that describes a sit-stand or semi-seated posture, characterized by a wide, open hip angle. If you’re committed to standing or maintaining an open hip angle, the standing designs might be your preference. If you’re planning to stand sometimes, and fully sit others, then a sit-to-stand design is your target. Does it Need to be Height Adjustable? Yes, height adjustability is highly recommended if you want a flexible workstation that accommodates all of your work and well-being needs. For example, when computing you may prefer one height; when reading or writing, another; talking on the phone, another; and so on. If more than one person may use it, adjustability becomes a necessity. Should I Get a Whole New Desk, or a Unit that Sits on Top of My Existing Desk? This is primarily a matter of preference, but you should also consider your available space, as well as the surface space you need to work effectively. When you think about your space, consider the “footprint” that either a desk or a desk-top unit will occupy, as well as the desktop work surface space your choice will provide. If you like to spread things out and keep a lot of elbow room, a full desk may be a better choice. If ample desk surface space is not needed, then a desktop sit-stand unit may be the perfect choice. Also consider compatibility with your other office tools and furniture, both in terms of function and aesthetics. For example, some cubicle designs are not easily adapted to adjustable work surfaces, so a desktop unit may be the only practical option. Height Adjustment – How High and Low Should it Go? We strongly encourage you to invest in a table, desk, or desktop unit that adjusts all the way from sitting to standing heights. They offer the greatest flexibility and support for healthy and productive work and long-term well-being. Each desk on the market has its own unique adjustment range, so you need to select one that accommodates you, or whoever will be using it, while in a fully seated position, and a fully standing position. Be sure to consider things like the thickness of the table/desk surface, the height of the keyboard surface sitting atop the desk, shoe height, the thickness of floor mats, or anything else that may affect these heights. Sit comfortably in your chair, feet flat on the floor while wearing typical shoes, with your upper arm resting at your sides and your elbow bent as if you were typing on your keyboard (don’t reach forward, stay comfortable! ), and measure the distance from the floor to the underside of your elbow. When working, your keyboard height should be at roughly that height or below. Stand up and take the same measurement. If you intend to use an anti-fatigue floor mat, also consider that height when taking this measurement. Select a desk that adjusts at least as low as your sitting elbow height and at least as high as your standing elbow height. Also consider adding casters to your table to create a flexible office environment, and be sure to consider the caster height in determining your final height adjustment range. If you’re unable to accommodate a shorter user, consider adding a footrest or an adjustable height keyboard tray to your workstation. In this case, you need to consider that employees may come and go, and that the desk may also be used by different people doing different tasks or working different shifts. You never know how tall or short a user may be, and you can’t be sure of the type of work they may perform, so you need the greatest amount of adjustment range you can justify. Since populations vary in height from country to country, region to region, it’s important that your selection will fit your particular population characteristics. If you’re purchasing or making recommendations for a corporation, government or institution, you may want to review Sit vs. Stand: Who Benefits from Sit-to-Stand Workstations? 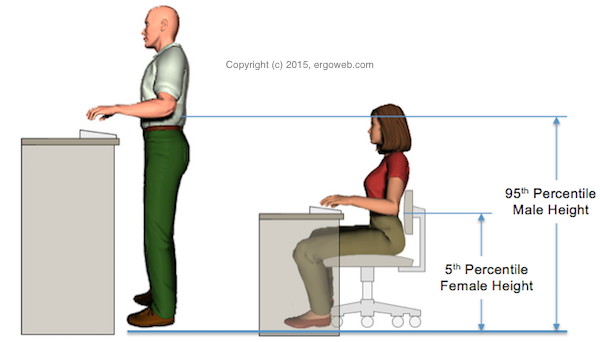 Select a desk that adjusts low enough to accommodate a 5th percentile height female and high enough to accommodate a 95th percentile height male. In the USA, there are two primary sources designers look to: ANSI/HFES, and BIFMA. ANSI/HFES 100: 2007 calls for a range from 22″ to 48″; BIFMA G1.23: 2013 calls for 22.6″ to 48.7″. In Europe, BS EN 527-1: 2011 specifies a range from 650 mm and 1250 mm (25.6″ to 49.2″). Also consider adding casters if you want a flexible and easily reconfigurable office, taking into account the height they will add to the table. Don’t skimp on desk depth, meaning the front-to-back tabletop distance as you face the desk. 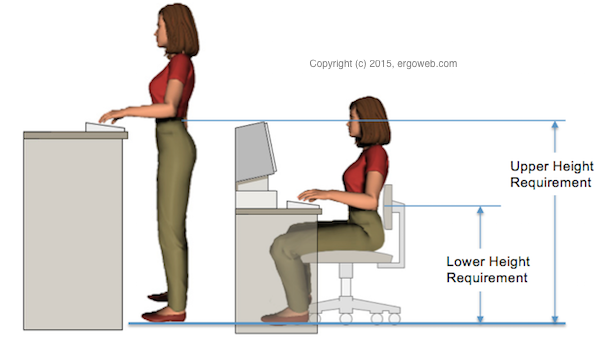 Most desks are available with at least a 30” depth, which is adequate for most users. Anything less will force the monitor closer to the user, which may impact visual preferences and capabilities, potentially reducing visual performance and inviting eye strain or discomfort. This is again a question of available space and your work preferences. Adjustable desks and tables come in many different sizes and shapes, including L-shapes, so pick the best option for your work habits and needs. As long as you adhere to the other recommendations, electric or pneumatic are strongly recommended. Crank adjustments generally require far too many “cranks” to get them properly adjusted, and few users have the patience to use them. However, if you choose a standing/perching design, a crank can work just fine, since the adjustment range is limited. Each adjustable desk has a weight capacity, and most models have plenty of capacity for typical desktop items. However, if you anticipate a need to locate heavy items on the desktop, be sure to pay attention to weight capacities. Electric adjustable desks utilize small electrical motors, and some models are louder than others. If the desk will be used in the home, small office or a private area, noise is typically not a concern. However, if the desk will be in a public or open work area, consider the effect adjustment noise may have on co-workers or customers. None produce “deafening” volumes, of course, so this consideration is a matter of preference. This is also a matter of preference. Most electric desks and tables today adjust fast enough to satisfy most uses and users, but some adjust faster than others if speed is important to you. Do I need an Adjustable Monitor Arm? It may not be an absolute necessity, but we highly recommend one that gives you a range of vertical, horizontal, angular and rotational adjustments. Adjustable monitor arms help you do far more than set your monitor at a certain height; they also give you the flexibility to orient your monitor for lighting or glare conditions, change heights and angles and viewing depths to relieve eye strain and improve visual performance, and allow different users to easily adjust to their own viewing preferences. They’re great for collaboration and customer service too, providing flexibility for different viewing angles and orientations. Maybe, but probably not. As long as you’ve selected a height adjustment range that will accommodate comfortable seated and standing work heights (see above), you shouldn’t need a keyboard tray. However, if you are a shorter person, or need to accommodate shorter people while they work in a seated position, an adjustable keyboard tray that can adjust lower than the desk height may be appropriate. You can learn more about the pros and cons of keyboard trays from our article All About Keyboard Trays. Maybe. As long as you’ve selected a height adjustment range that will accommodate comfortable seated and standing work heights (see above), you don’t need a footrest. However, if you are a shorter person, or need to accommodate shorter people while they work in a seated position, a footrest may be appropriate. Also, many users who stand report increased comfort by alternating the weight of one foot or the other on a footrest, so if standing fatigue is a concern, a footrest can help. Do I Need a Cushy Floor Mat? Like a footrest, standing users often report greater comfort when using an anti-fatigue mat, so it may be a welcome addition to your work space. Do I Still Need a Chair? Yes, unless you are one of the rare people who can comfortably stand all day, every day, you will still want a chair at your computer workstation. However, instead of a costly high-end chair with all the bells and whistles that support sedentary workers, the active work station and work habits a sit-stand arrangement encourages might relieve some of that need. Other seating options to consider are stool-like sit-stand devices that support a “perching” position. These are typically not designed for long-term sitting, and may even become uncomfortable after 20-30 minutes or so. That might actually be a good thing, since it can trigger your mind to remember “it’s time to move,” which is the ultimate goal for effective ergonomics at a stand up workstation. Peter Budnick, PhD, CPE (Certified Professional Ergonomist) has dedicated his career to growing the value, awareness and influence of ergonomics. He's published extensively, been a featured keynote, plenary, workshop and technical session speaker at national and international corporations and conferences, volunteered extensively for professional organizations, and is a successful entrepreneur. Complete the form below, or call 435-214-4269 during normal business hours.